Mobile learning is an integral part of any contemporary training strategy ... or should be by now. The toughest challenge however is to build a toolkit of mLearning options that cater to the variety of learning that needs to be done in an institution/corporation. In the last couple of weeks I have been looking at ways to offer solutions for spaced learning. An options that allows your learners to stay up-to-date with specific content that must be delivered multiple times for immediate memorization. 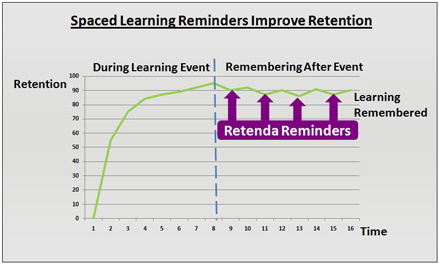 For those not sure about the spaced learning effect, I embedded a graph provided by Retenda who rock in spaced learning http://www.retenda.com/ and how their spaced reminders effected retention. Before sharing the mobile option, it makes sense to understand the complete dynamic of the principle of spaced learning. In classrooms you can create a perfect setting to get spaced learning going. A wonderful synthesis with lots of information is shared here by the Innovation Unit of the Monkseaton High School. They have put together a publication outlining all the steps to integrate spaced learning with inquiry based learning for optimal memory results. Now this becomes more difficult with learners in a corporate setting, as you do not have that many face-to-face moments... but this is where the mLearning options come in. With these mobile options you can deliver the content that needs to be memorized through mobile apps, with algorithms that enable those questions that were not answered correctly (yet) to be repeated for that particular user. It is a great way to provide any content that is cross institutional/corporate like for instance first aid, or security guidelines, or new guidelines overall. It takes some time to get things organized, but it is well worth integrating it in your overall mLearning. For all of you in the neighborhood of Belgium and interested in how the Higher Education landscape is changing, feel free to join a wonderful set of Educational thinkers on Thursday 25 April in the UFO room at the University of Ghent. One of my long standing professional friends Frank Gielen is one of the speakers at this event and he is a die-hard pioneer of combining academic knowledge with entrepreneurial leadership and innovation. As a mobile learning expert we have had wonderfully inspiring discussions on how mobiles change education. His vision is a balanced combination of research and corporate use of new research findings to strengthen a nation and secure jobs, sustainable economics and continues knowledge creation. In short he is a believer in combining tech with humanity and sound economics. Loving the title of the debate: The university is dead! Long live the university! How can higher ed strengthen the Flemish welfare state? How can higher ed deliver strong innovators to its corporate firms? What does higher ed have to do to prepare its students for a 50 year long career, filled with change and lifelong learning? What does society expect from its university graduates? Is there a need for shorter or longer educational tracks to fill in the needs of corporate job demands? How can we balance the need for diverse jobs when many students opt to go for knowledge based jobs, instead of aiming at the wide range of necessary jobs inside society? on 25 april 2013 at 19u30 and its free! Get your free Kindle app for most of the mobile devices out there! 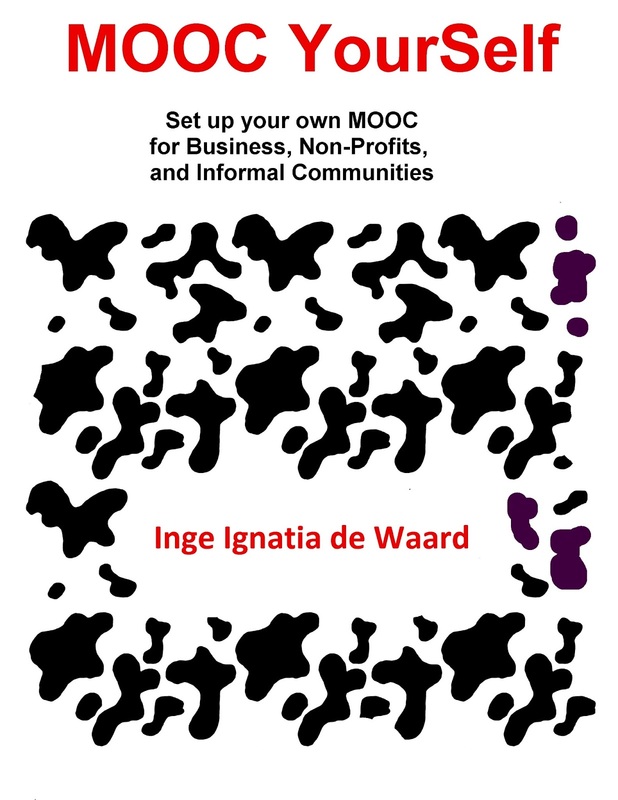 Last week I published my eBook on MOOC YourSelf, setting up your own MOOC with guidelines for facilitators, newbies, mobile learning adepts.... This lead to some inquiries via blog and mail, especially on the fact that the book was written to be viewed with one device, namely the Kindle. And understandably, some people hesitate to buy a new or another device in order to read books that they can also read on other devices. So this got me on a search to find out whether one would actually really need a Kindle in order to view or read my book. And it turns out there are free apps out there - offered by Amazon - to enable readers to read eBooks written for Kindle. Great! Take a look at the free Kindle apps here. 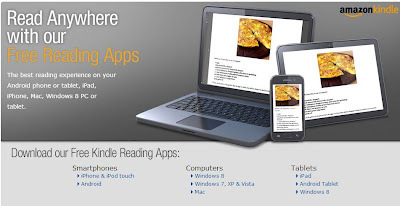 The free Kindle apps are available for smartphones (Android, iPhone, iPod touch), computers (Windows 8, Mac, Windows XP), and tablets (iPad, Android, Windows 8). So this covers many of the devices out there. The books are still to be paid for, but ... the Kindle publishing option does allow more of the revenue to go straight to the author, which is a nice thing. So hope this helps in giving my book and other authors a chance to get their work straight to your favorite device. The last few weeks I have been finalizing my first eBook. And now, I just published it as part of the Kindle Direct Publishing option in Amazon. In the book I am looking at different MOOC options (cMOOC, xMOOC), fitting it in with the best online learning practices of eLearning, offering design and learning options, looking at pedagogies and some certification options, and providing suggestions to embed mLearning and social media options to improve training via MOOCs. 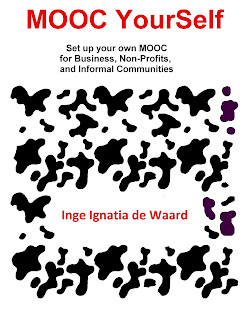 The full title of the book is: MOOC YourSelf - Set up your own MOOC for Business, Non-Profits, and Informal Communities. So if you are dabbling with the idea to set up your own MOOC or you want to learn a bit about MOOC history, have a look at this eBook or contemplate buying it (it is low-cost). This MOOC eBook gives a short overview of options on how to set up your own MOOC and how to tailor it to your own needs, tools and target audiences. The challenges and benefits of MOOCs are highlighted and guidelines on how to build an optimal MOOC experience are shared. Online learning best practices' are listed with a focus on MOOC specific learning characteristics, certification options and pedagogies. Taking into account the current learning realities, the book also looks at mobile options and social media tools for learning, specifically how they can be fitted into a MOOC learning environment. To provide a background on MOOCs, the history of MOOCs is covered. The upcoming and existing MOOC platforms and toolkits are also described and linked to. Additionally, the book offers links to DIY options, and existing MOOC opportunities that might offer a solution for what you are looking for. The author has organized mobile MOOCs in the past, and has been researching MOOCs and their learning affordances for the past 3 years. Keeping track of all the good content I come across while I am surfing the internet has never been my forté. Although I bookmark, make annotations ... after a short time the only thing I remember is that I did see something about something somewhere. So any solution that can provide me with some automated logbook is just the thing I am looking for. While I am following Tin Can which is unraveling the personal learning path chaos as mentioned in a previous blogpost, I recently came across the Locker Project, which was the runner up for the commercial data idea of Singly. The starting point of the locker project, and as such Singly is simple: a locker is a container for personal data, which gives the owner the ability to control how it's protected and shared. It retrieves and consolidates data from multiple sources, to create a single collection of the things you see and do online: the photos you take, the places you visit, the links you share, contact details for the people you communicate with, and much more. From this idea Singly became a reality. Singly takes all the applications and tools that are based in the cloud and offers an API to get meaningful interactions, data, connections from it. If you are a mobile developer, you can take the Singly app and transform it into a data driven, socially connected, cloud, mobile app that fits your content or interaction needs. Sounds cool! And if you embed this type of app in a MOOC learning environment, you would be able to filter out the MOOC related data easily (and automated) via hashtags or tags in general, allowing all your MOOC content to be open to the public, yet filtered for the MOOC audience at the same time. That sounds great! What this brings to mind is more semantic learning. Because if the data I collect is collected, and meaningfully classified for further processing (e.g. keywords in relation to my personal keywords, appreciations of people I am connected with, discussions of peers ....) ... it will enable me to get more tailored, personally relevant information my way. For let's face it, I am never going to be able to keep up with all the content which is created on the web, nor will I be able to critically analyse everything myself. So in some way an automated critical screener needs to be put into place for me to be able to keep on top of what I am interested in, while also enabling me to feel comfortable data wise (nothing simple about that). The privacy is something I am not sure about. Because what Singly does is take care of all your profiles (which also means it knows all my profiles if I let it... not sure how this makes me feel yet). Currently they enable data gathering and filtering from a number of online tools you can see the list here. If you are a mobile developer, have a look at the iOS SDK, Android SDK, and open source. And if you built a learning app using singly, let me know! As the West (or North, struggling to find the right description, but meaning the developed world) is looking for new ways to finance the shift that is taking place in education (MOOCs and Higher Education), it would feel logical to me that inclusive education will be born in developing regions, hopefully bringing along financial options that can help people in the developed regions that are increasingly fighting poverty and seclusion from educational resources. Low cost pay-as-you-attend courses paid via mobile banking are tested in African regions and those projects look promising (based on the article provided). The nice thing is that the model also takes into account accreditation across continents (tough job!) and is linked to regional or specific group infrastructures (e.g. mobile options). - if you don't like the ride, you can get out and find another taxi. The current problem with the changes in Higher Education (and training) are that business models behind it. Everyone is looking for the goose with the golden eggs and ... probably it is just going to be some golden ideas spread about all the possible geese (all of us included). 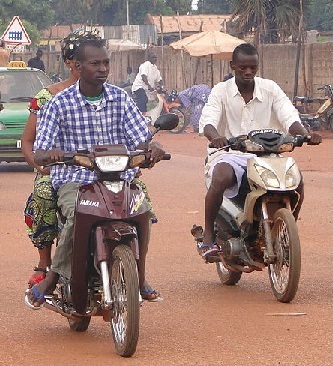 Nevertheless, this article from the worldbank on a new wave of educational efforts across Africa exploring the use of ICTs offers an interesting option that even fits existing durable trends (like the taxi-brousse or share taxi example. Some of the World Bank staff teamed up with 2iE people to get an approach together that would allow low-cost tuition where the student/learner can hop in a module, and hop out again once either the money runs out (temporarily) or the content is not what they had hoped for, leaving them the option to go for a different training instead. Inevitably this leads to online courses, that have a pay-as-you-go/attend financial basis, including m-payment options as well as sms-based outreach programs. Of course the telecom companies were brought in to support via e-education based cost offerings and different pilots were launched to see which options worked best (feel free to read up on them in the article). This approach puts learning options into the hands of the learner, and does not put an immediate huge financial strain on the student. It offers economic planning based on knowledge needs (well, still I think education should be open to all, but any solution providing more access to education is very much welcomed). The nice thing about 2IE is that it is an international higher education and training institute which delivers courses and training that result in programs that are accredited in both the African continent as well as in Europe. Which is in itself already an endeavor. The 2iE offer courses in the areas of Water and Sanitation, Environment Energy and Electricity, Civil Engineering and Mining Industry and Management Sciences. Juggling too much is getting to me, and where my initial action is to cloak myself with silence, I feel it is better to do just the opposite. Ever since I started my PhD it felt as though my identity was undergoing changes as well. All of a sudden I am no longer a researcher that is out there in the field, or an active player, but a simple student digging into unknown territory, trying to gather some interest... I no longer have a budget that I can manage and direct towards goals that need to be achieved (including getting myself out there in the open, at conferences, physically among peers I learn from). So, it really feels as though my identity is changing and to be honest I do not know what to do with it ... yet. On another note it is hard to juggle all the administration and organization that comes along with starting/doing a PhD in a foreign country, certainly as I feel responsible for my whole family (which my partner tells me not to do, for we are indeed a team, but still... it is me who is the asking party in this endeavor). Practically I am juggling to meet schedules and to keep everyone happy... and looking at the silence on my blog, it tells me that time wise I am not doing a great job. To me, my blog is a representation of good time management. If it keeps having a balanced flow, I am good... if it falls flat, I need to take a look at what I am doing and how. I am of course fully aware of the luxury position I am in: being able to investigate something I am curious about is simply fantastic, even though less money is coming in. But I simply was not aware of the multitude of organizational elements that need to be sorted, and that takes a bit of a toll. The only option to take in times of pressure is ... to read. Luckily there are always books ... so digging into the Flow creativity by Mihaly Csikszentmihalyi and Aaron Silvers directed me towards Pema Chodron on living beautifully with uncertainty and change. If any of you have books that might help to refind focus ... feel free to share.